Below the Citadel is the magnificent Roman amphitheatre, an impressive relic from ancient Philadelphia that is cut into the hill and can seat up to 6,000 people. The theatre is still used occasionally for events today. Two cultural museums form part of the complex: the Jordan Folklore Museum, which has exhibits on traditional life, and the Museum of Popular Traditions with traditional costumes and mosaics from 4th to 6th century Jordan churches. The theatre was built during the reign of Antonius Pius (138-161 CE) and is today a famous landmark in Amman and of course the ancient Roman city Philadelphia. 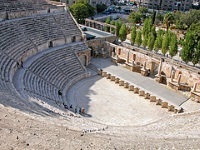 It surrounds the Hashemite Plaza, Odeon theatre and the Nymphaeum.